Located in a relatively dry region and characterized by mainly sandy soils, the German Federal State of Brandenburg (surrounding the capital city of Berlin) is especially vulnerable to climate change impacts (e.g., summer droughts) and cascading effects on ecological systems (e.g., decreasing ground water tables, water stress, fire risk, productivity losses) with socioeconomic implications. Furthermore, a complex interplay of unemployment, rural exodus, and an aging population challenges this structurally weak region. We discuss adaptation measures that are either implemented or planned, as well as research into adaptation strategies to climate change for the sectors forestry, agriculture, and water management as well as in nature conservation in light of socioeconomic and ecological challenges and benefits. In doing so, we adopt a systemic view of Brandenburg where the sectors discussed are seen as subsystems embedded in a larger regional system. 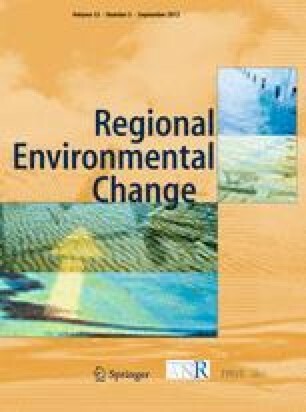 This at least partially holarchical approach enables the identification of conflicts between adaptation measures, but also of synergies among the sectors that pertain to successful adaptation to climate change. The insights gained ultimately highlight the need for cross-sectoral, adaptive management practices that jointly target a sustainable regional development. This article partly builds upon the experiences gained during the field trips carried out in the course “Response Strategies: Adaptation to Global Change” in the framework of the Global Change Management Master Course at the Eberswalde University for Sustainable Development—University of Applied Sciences, Eberswalde, Germany. The students and excursion guides are greatly acknowledged for the valuable discussions. C.R.’s position has been partly funded by the MOTIVE project. Several of the authors received funding through the INKA BB project. P.L.I. has been awarded a research professorship by Eberswalde University for Sustainable Development. We are grateful to Lena Strixner, Anne Holsten and Ylva Hauf for preparing the maps shown in Fig. 2 and to Paul Pichler and Julia Reinhardt for their help with Figs. 1 and 5, respectively. An earlier version of this paper benefitted substantially from comments made by Elena Bennett and one anonymous reviewer.